We concluded our first round of PlaySmelter readings with Jesse Brady’s The Ballad of the Locked Out Gang. 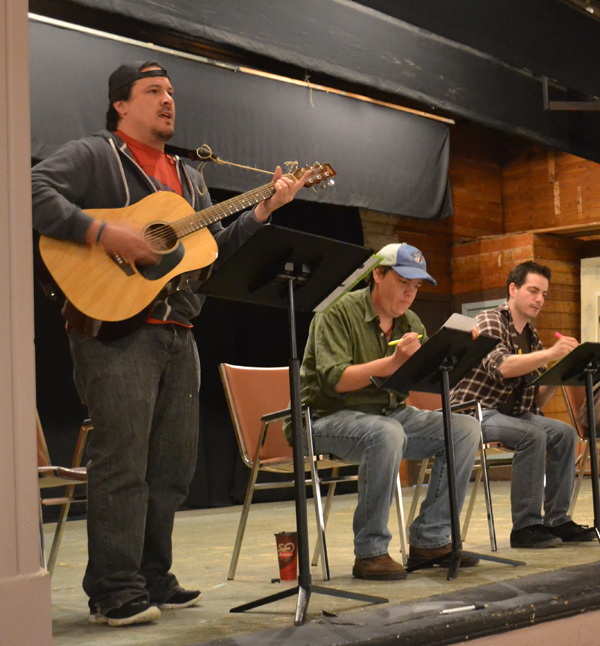 As a Sudbury native, recently returned to his hometown from Ottawa, this is Brady’s first play and first introduction to a full workshop process. In The Ballad of the Locked Gang, three miners plan a gold heist to assist them through a fictionalized version of the 1978 strike. Desperate for money to assist their families, and wanting to do more than protest on the line, three friends dig a tunnel into the gold storage warehouses and deal with the consequences of their decisions. The entire play is told through the lens (or microphone) of a folk singer who introduces us to the story and performs sporadically to update everyone on the status of the gang. Due to this narrative device, our initial discussion kicked off with the concept of the narrator. Initially described by one of our actors as “the guy who’s kind of like the snowman from Rudolph the Red-Nosed Reindeer,” it prompted an in-depth discussion about the concept of a narrator. Are these types of characters storytellers or storymakers? If the folk singer has license to embellish or exaggerate, how much of what is presented on stage is true? Does he exist at the same time as the story? Is he speaking to us from the present? Did someone tell him the story or has it been passed down? Is he a Sudbury local? A miner? These were important questions to ask because it opens up a variety of ways for Brady to present his play. Stories are infused with emotion and opinion when they are spoken, so we had to ask ourselves about the emotional state of the narrator. Is he angry about the strike? In awe of this legend? Is he in the process of constructing the title song throughout the play or has it already been written? If this play is the folk singer’s song, how does that affect structure? If the play is in actuality a folk song, where are the verses, the chorus, the bridge in the play? A discussion of the narrator spiraled into a discussion about genre. With a character simply titled ‘folk singer’ in a play with ‘ballad’ in the title, one would naturally assume that the play was intended as the telling, playing or construction of a ballad. But there are many different elements in Brady’s play, and the possibilities are exciting. There is a heist, moments of serious drama, comedic scenes and realistic and exaggerated characters. Is this play a ballad? Or is it something else?